A direct command…very specific…straightforward and to the point. It doesn’t leave much room for misunderstanding or misinterpretation. In terms of importance, this is one of the Big Ten…the commandments written in stone by the finger of God, Himself…given to Israel as their covenant vows…placed inside the Ark of the Covenant. Most pastors, preachers, and teachers today would agree this is an important commandment that is still as relevant today as when God gave it to Moses. A high percentage of those same pastors, preachers and teachers also support the death penalty…believing the Old Testament laws calling for capital punishment set a standard that is still relevant today. Likewise, many Evangelical pastors in The United States strongly support the right to bear arms…to carry lethal weapons for use in defense. Most Christians also strongly support the need for an armed military to protect and defend our nation. How can these men agree the very direct, very specific, very clear law written in stone by God, Himself, “Thou shall not kill,” is relevant today, yet support killing people…for any reason? It is because they are able to look past the letter of the law to the principle behind the law of the sanctity of life. They are able to apply common sense and realize that sometimes killing is necessary in order to preserve life. And they are able to see the many biblical examples demonstrating that following the principle behind the law sometimes requires violating the letter of the law. Another very direct command…very clear…very concise. This one is also one of the Ten Commandments written in stone by the finger of God, Himself. Surely, there can be no doubt as to the meaning, significance or importance of this command. Fortunately, this command doesn’t carry as much moral dilemma as the previous. This one should be easy to keep. Yet, other than the Seventh Day Adventists, almost no Christian churches today keep the Sabbath. We do not treat Saturday as a holy day set apart for worship. We have no issue with working hard on Saturdays. How can this be? Why would one of the Ten Commandments written in stone by God, Himself, be treated so lightly by people professing to serve Him? 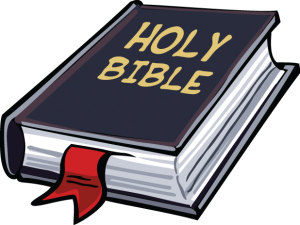 Why would people quick to declare the Bible as their guide…quick to say “God has not changed His mind”…quick to say “the Bible says” so easily treat this law as insignificant? It is because we believe we are keeping the spirit of the law by worshipping on Sunday. Yes, we realize Sunday is the first day of the week, not the seventh. Yes, we understand the Bible is very clear that Saturday is the Sabbath and we are to keep the Sabbath holy. However, since Christ arose on a Sunday, we feel confident we are keeping the spirit of the law by worshipping on Sunday. After all, hasn’t the Christian church worshipped on Sunday for thousands of years? And didn’t Jesus say, “The Sabbath was made for man, and not man for the Sabbath”? So, once again, we choose to neglect the letter of the law to follow the spirit of the law…this time with no moral dilemma to justify the deviation…just traditions. Yet, knowing we are under grace, not under law, we feel confident the letter of the law may be sidestepped in keeping the spirit of the law. Another very direct command with little room for misunderstanding. Another of the Ten Commandments written in stone by the finger of God, Himself. Surely, this command is clear and easily followed. Yet, look at the number of statues and monuments we have erected. Look at the current social and legal battles being waged over Confederate monuments. Aren’t we fighting to preserve what God has forbidden? Could the Bible be any more clear? Yet, we justify these as cultural icons that have nothing to do with religion. We argue these are not idols or objects of worship and, therefore, do not fall under the biblical prohibition. But wait…isn’t the purpose of the Bible to affect how we live our secular lives? Is it really a good idea to separate the spiritual from the secular to the extent we violate a direct biblical command under the justification it is a secular matter rather than spiritual? And don’t the intense emotions and fierce defenses, themselves, bear witness to these monuments carrying some deeper meaning than simple artistic décor? If we make defending a monument a higher priority than loving our neighbor, doesn’t that border on idolatry? My home state of Arkansas is currently waging a legal battle over a Ten Commandments monument recently erected on the grounds of the state capitol. Frankly, this one has me shaking my head. Knowing it would almost certainly draw legal battles, our state legislature somehow decided it was important to have a Ten Commandments monument erected at the State Capitol. 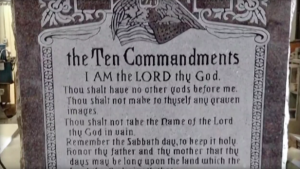 How ironic, our state legislators would consider The Ten Commandments to be so important they needed to be included in a monument at the state capitol…so important the monument is worth the expense of multiple legal battles…yet not important enough to actually obey the commandments. To so revere The Ten Commandments that one would erect unto them a monument…in direct violation of the commandments themselves…I don’t get it. Yet, whether I understand it or not, hundreds of thousands of my fellow Arkansans…my Christian brothers and sisters…strongly support the monument…and apparently see no contradiction in its erection. The very clear letter of the law is shoved aside in eager support of what they believe to be the spirit of the law. Do you see how readily we set aside the letter of the law while claiming to embrace the spirit of the law? How easily, we justify a law as being of lesser importance under our New Covenant of grace? How fluidly we apply common sense to biblical examples to justify violating the letter of the law? We are quite adept at it…and very willing. In fact, we may even feel a sense of pride in steering clear of legalism to pursue the intent of God’s heart. Which is great…so long as we truly are pursuing God’s heart! No. It’s not. There is no such commandment. In fact, the law God gave to Moses very clearly makes provision for just divorce…very clearly tells how a divorce is to be administered…and very clearly declares both parties are free to marry someone else after the divorce is final. Now, some may say Jesus prohibited divorce in the Sermon on the Mount recorded in Matthew chapter 5. As I pointed out in this recent post, that interpretation contradicts the whole premise of Jesus’ Sermon on the Mount. Obviously, we know better. We understand Jesus was not adding to the law, but rather was transcending the law by demonstrating righteousness cannot be attained by rigid adherence to external laws. Righteousness can only be attained thru a new heart by the power of The Holy Spirit. By applying common sense and understanding of grace, we are able to see past the letter of the written command to the intent and the character of God, and act accordingly. Why is it then, that on the topic of divorce so many Christians do the opposite? With very clear direct commands, “Thou shalt not murder”; “Thou shalt honor the Sabbath day and keep it holy”; “Thou shalt not make unto thyself any graven images” we are able to look past the letter of the law and apply the principle behind the law…pursuing God’s heart with an understanding of God’s grace and situational common sense. Yet with divorce, in the absence of any clear scriptural prohibition, many theologians and preachers pluck verses out of context to create their own supposedly biblical understanding of a supposed prohibition…to rigidly apply to every situation with no latitude, grace, or common sense whatsoever. This is precisely what Paige Patterson, John Piper, and others like them have done in telling abused spouses they cannot divorce. They have fabricated their own commandment where there was none, then rigidly applied it with no grace or common sense whatsoever. If we were going to be legalistic, shouldn’t we at least be legalistic on points of clear direct scriptural command? If we were going to be rigidly legalistic on some topics and less rigid on others, shouldn’t we be less rigid on topics on which scripture provides no clear prohibition? Why would we find latitude to skirt very clear scriptural commands, then rigidly apply man-made doctrinal rules where scripture provides no clear prohibition? Doesn’t that stance reveal a heart consumed with arrogantly defending doctrinal positions rather than humbly acting in love through faith by the leading of The Holy Spirit in accordance with scripture?